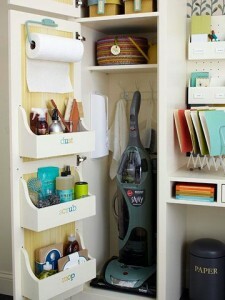 Keeping your home organized takes a lot of time and effort. We always see perfectly clean and organized rooms on Pinterest and think that it’s nearly impossible to keep a room in perfect order like that. Let’s be honest—things pile up, our kids move stuff and bring things home that we don’t want, and as time goes on, the clutter starts to rule over every room. It’s true, getting organized can be tricky if you feel like you are overrun by clutter, but the key is to implement storage and organization systems in each room that will make it easier to keep things in order. If you need a little help figuring out how to implement savvy storage systems in your own home, read ahead for a few ideas that can lend you a hand. One of the most cluttered places is often the kitchen. Over the years you accumulate casserole dishes, extra pots and pans, and before you know it, the kitchen is overrun with clutter. It can be tough to keep the kitchen organized since several people use the area and don’t always put things back in the same spot. If you have a lot of kitchen wear, you can categorize items and put them into bins. That way, when you go to find a bot or pan, you can pull out the bin instead of having to rummage through a pile. 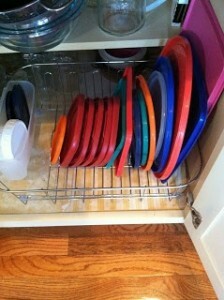 Another helpful tip for maintaining order in the kitchen is to create a system for your Tupperware. We all know that matching Tupperware to it’s correct lid is nearly impossible, but if you organize the lids according to size and slide them into slots on a drying rack, it will be much easier to make the match. If you’ve accumulated a lot of stuff, get rid of things you don’t use or have doubles of. Kitchen space is precious so make sure every inch is being used properly! We all know that closets are where a lot of miscellaneous items end up. Instead of creating one giant pile, use the actual closet door to your advantage. Over the door racks are perfect for hiding shoes or cleaning supplies, and this will open up shelf space inside the closet. If you don’t want a hanging rack, you might consider attaching small wire baskets or bins to the inside or outside of the door to give you a little extra space for odds and ends. If the closet is holding clothes, you can use vertical hangers stacked on top of one another to open up extra room along the rod for more hangers. Closet organization can be tricky, so you might have to get creative. But when you find a system that works, all that extra space will pay off. If you have a big family, clothes and accessories take up a lot of precious space. 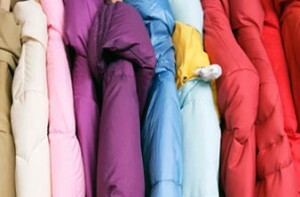 Heavy coats, thick sweaters and mountains of gloves, hats, and scarves take up more room than you’d like and it can be annoying to keep them around all year when you only use them for three months. If you’re tight on space, consider moving your winter clothes to the attic once spring has sprung. If you’re really cramped for space, you can rotate clothes out every season so that your closets aren’t bursting to fit all four seasons of clothing in there. If you have an overflow of clothing, this might be a good time to purge. Anything you did not wear the previous 4-6 months and is not brand new, donate! If it doesn’t fit, has a hole, or wasn’t worn a single time last year, donate it. Depending on how much you use your garage, it has likely turned into a haven for useless, broken, or unwanted items. Garage storage can be tricky because there is usually limited space. Remember: the walls are your best friend. Adding shelving and hooks to the walls of the garage will allow you to stack and hang things, freeing up more space than you could ever imagine. The professionals of A&B Overhead who specialize in garage door repair suggest that you install shelving around the upper levels of the garage (above your head) and then install hooks on the walls where you can reach them. Then, you can store items that you use less often on the higher shelving since it will require a step-stool to get those things down. 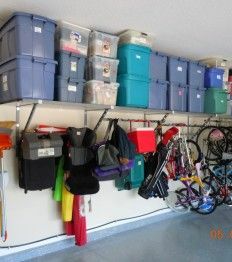 By placing things in order of how often you use them, will make it so you don’t have items that you only use once a year sitting at your feet every time you walk into the garage. To get organized, you need to implement storage units and strategies throughout the home, and these storage systems might be different for each room. Once you get the supplies you need, you can condense, compile, and de-clutter. Plastic bins, wire baskets, and plain shelving are perfect solutions for getting organized in any room. However, if you want to make your storage more cohesive to the design of your home, look on Pinterest for clever storage ideas that are also aesthetically appealing. The key to getting organized is to find what works for you and your family, and don’t get discouraged. Once the new system is set in place, it will be much easier to say bye-bye to clutter and hello to more space in your home.